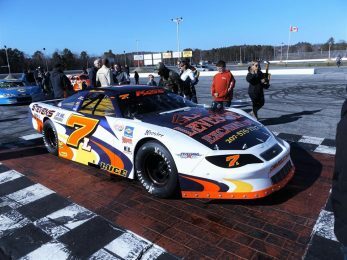 Glen Luce of Turner followed up his most successful racing season ever with an opening day victory in the Budweiser Championship Series Super Late Model division season-opener Sunday afternoon at Oxford Plains Speedway. Luce, who fulfilled the goal of most every Maine stock car racer with a $31,000-plus victory in last year’s Oxford 250, nailed down this 50-lap triumph after an early battle for the lead with Norway’s Chris Coolidge. Late in the going Luce had to turn back a challenge from Buckfield’s Timmy Brackett, the track’s reigning Super Late Model champion. Brackett finished up .036-seconds behind the winner at the line, with Coolidge coasting home in third position. Adam Polvinen made up a lot of ground late in the race to earn a fourth-place finish, with multi-time Late Model track champion Shawn Martin of Turner completing the top five. Sixth through tenth-place finishes were earned by Scott Robbins, rookie Josh Childs, Kyle Treadwell, Reid Lanpher and Ryan Deane. Coolidge and Luce won the Super Late Model heat races. Calvin Rose, Jr. of Turner prevailed in the 30-lap headline race for Allen’s Coffee Flavored Brandy Street Stock division competitors. Rose, rookie of the year in the top support class last season, found his way by a torrid battle for the top spot between Matt Dufault, Rick Spaulding and Jonathan Emerson in impressive fashion. Dufault, who led a healthy portion of the early laps, survived the paint-swapping battles in second position, with 2015 championship runner-up Zach Emerson of Sabattus making a late charge into the final podium finishing position. Lisbon’s Spaulding and Kyle Hewins of Leeds filled out the top five rundown. Jonathan Emerson and Dufault were heat race winners. Auburn’s Brandon Varney cruised to victory in the 20-lap main event for entry-level Bandits division competitors. Varney had veteran frontrunner Jamie Heath of Waterford in his mirror for most of the race. Heath claimed the Bandit division’s runner-up hardware, with Cam Childs of Leeds crossing the finish line in third position. Matt Mahar of Buckfield and Oxford’s James Record rounded out the top five. Varney, Childs and Oxford’s Charlie Hall won heat races. Shane Green of South Paris earned his first trip to victory lane in the Figure 8 division’s 15-lap race. Green led most of the way after last year’s champion, Jon Lizotte, was eliminated in a first-lap crash with the winner’s teammate. Robert Morey of Lisbon was the runner-up, with newcomer Kyle Kilgore of South Paris claiming the third-place trophy. Budweiser Super Late Model (50 laps) 1 7 Glen Luce, Turner; 2 60 Tim Brackett, Buckfield; 3 72 Chris Coolidge, Norway; 4 73 Adam Polvinen, Auburn; 5 94 Shawn Martin, Turner; 6 36 Scott Robbins, Dixfield; 7 3 Josh Childs, Oxford; 8 44 Kyle Treadwell, Buckfield; 9 59 Reid Lanpher, Manchester; 10 54 Ryan Deane, Winterport; 11 61 TJ Brackett, Buckfield; 12 24 Gunnar Rowe, Turner; 13 46 Dennis Spencer, Oxford; 14 75 Gary Smith, Bangor; 15 53 Alan Wilson, Hebron; 16 Poncho Darveau, Augusta; 17 0 Spencer Morse, Waterford; 18 25 Shawn Knight, South Paris; 19 01 Sammy Gooden, Whitefield, NH; 20 3 Vanna Brackett, Buckfield; 21 03 Scott Moore, Anson. Allen’s Coffee Flavored Brandy Street Stock (30 laps) 1 8 Calvin Rose, Jr., Turner; 2 61 Matt Dufault, Turner; 3 23 Zach Emerson, Sabattus; 4 36 Rick Spaulding, Lisbon; 5 51 Kyle Hewins, Leeds; 6 58 David Whittier, West Poland; 7 24 Jonathan Emerson, Sabattus; 8 04 Zach Bowie, Greene; 9 33 Andrew Breton, Sabattus; 10 55 Kurt Hewins, Leeds; 11 56 Mike Short, Auburn; 12 4 Jordan Russell, Norway; 13 77 Bryce Mains, Naples; 14 60 Richard Wentworth; 15 81 Wayne Reynolds; 16 71 Jason LaValley, Auburn; 17 25 Mike Rand, Bridgton; 18 14 Brian Caswell, Portland. Bandits (20 laps) 1 Brandon Varney, Auburn; 2 91 Jamie Heath, Waterford; 3 02 Cam Childs, Leeds; 4 0 Matthew Mahar, Buckfield; 5 82 James Record, Oxford; 6 26 Tyler Green, Turner; 7 8 Joshua Knoll, Mechanic Falls; 8 13 Bill Grover, Waterford; 9 05 Gerard Cote, Oxford; 10 11 Jason Porter, Freeport; 11 18 Brian Hiscock, Turner; 12 56 Adrianna McDaniel, Bridgton; 13 4 Caleb Emerson-Mains, Durham; 14 40 Chase Emerson, Turner; 15 3 Charlie Hall, Oxford; 16 33 Matt Hiscock, Turner; 17 41 Brad Johnson, Fairfield; 18 28 William Barker, Oxford; 19 44 Rick Montminy, Auburn; 20 77 Rob Crepeau, Minot; 21 08 Michael McKinney, Sr., Berlin, NH; 22 17 Dan Wade, New Gloucester; 23 32 Troy Smith, Bridgton; 24 5 Jake Hall, Oxford; 25 00 Jake Roberti, South Paris; 26 22 Cody Billings, Hartford; 27 14x Adam O’Neil, Lewiston. INEX Legends Cars (25 laps) 1 88 Nicholas Naugle, Dartmouth, Nova Scotia; 2 129 Trevor Sanborn, East Parsonsfield; 3 29 Austin Teras, Windham; 4 1 Todd Libby, West Baldwin; 5 4 Peter Craig, Poland; 6 3 Justin Stacey, Hiram; 7 4 Thomas Everson, Gilmanton, NH; 8 21 Brenna Humphrey, Cornish; 9 7 Kayla King, Buxton. Arians/Gravely Dave’s Small Engine Figure 8 (15 laps) 1 61 Shane Green, South Paris; 2 3 Robert Morey, Lisbon; 3 4 Kyle Kilgore, South Paris; 4 27 Jon Lizotte, Lewiston; 5 6 Geoff Low, Minot; 6 97 Eric Hodgkins, Auburn.